BRISTOL, R.I.— In the quality- and price-sensitive aircraft industry, weight savings translate into lower fuel costs and increased productivity. That’s a big reason why SFS Intec (stylized as SFS intec) is partnering with TxV Aero Composites in the re-design of an aircraft storage bin bracket. SFS (www.sfsintecusa.com), a provider of precision custom components and special fasteners, is qualifying TxV’s hybrid overmolded composite part for use in a commercial aircraft. Originally made from aluminum, the new bracket will be made of Victrex AE™ 250 composites, overmolded with Victrex™ PEEK (polyetheretherketone) polymer. The weight, size, complex geometry, and high load-bearing specifications of the overhead storage bin bracket made the SFS part a suitable candidate for the hybrid overmolding technique at TxV. Another consideration was the 60-to-70 percent scrap produced through several milling steps required for the original aerospace-grade aluminum bracket. TxV believes it is positioned to meet the industry’s cost and weight challenges through the combination of its state-of-the-art automated manufacturing and the processing and performance advantages of PAEK thermoplastic composites. The company produces finished composite parts, complete hybrid overmolded components, and assemblies using continuous manufacturing processes with cycle times measured in minutes, rather than the hours required by thermoset alternatives. These innovative products are reported to deliver weight savings of up to 60 percent over conventional metallic solutions. Victrex AE 250 composites are based on the PAEK (polyaryletherketone) family of high- performance polymers and are specifically designed for lower temperature processing. 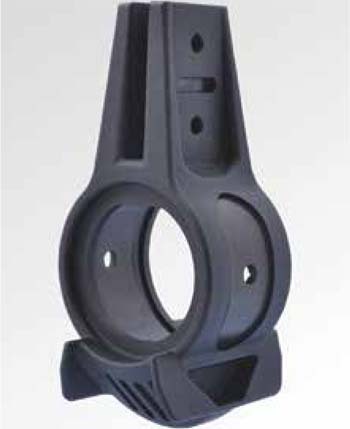 This is said to enable a unique hybrid molding process that combines the strength of continuously-reinforced thermoplastic composites with the design flexibility and proven performance of Victrex PEEK overmolding polymers—in this case, Victrex PEEK 150CA30. Commercial aircraft use thousands of brackets and system attachments from the cockpit to the tail of the plane. 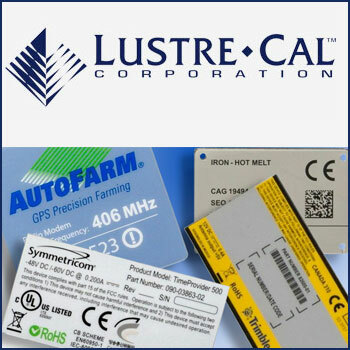 As a result, these components can account for significant cost and weight. The high-performance PAEK polymer-based components can be manufactured more efficiently than conventional thermoset alternatives and can deliver significant weight savings compared to aluminum, stainless steel, and titanium, according to TxV. They are also said to offer equivalent or better mechanical properties, such as strength, stiffness, and fatigue. TxV Aero Composites (www.txvaero.com) is a U.S-based manufacturing facility that began in early 2017 as a joint venture between Victrex plc (www.victrex.com), a supplier of PAEK and PEEK-based high-performance polymer solutions, and Tri-Mack Plastics Manufacturing Corporation. Their objective was to accelerate the commercial adoption of polyketone-based composite applications throughout the aerospace industry by leveraging the manufacture of parts using new and innovative processes.